Let’s give our kids the chance to discover manufacturing-related jobs. SME-EF & NASA helps Wheeling High School – The SME Education Foundation has teamed up with HUNCH (High School Students United with NASA to Create Hardware) to give these gifted STEM students a chance to make hardware for the International Space Station. 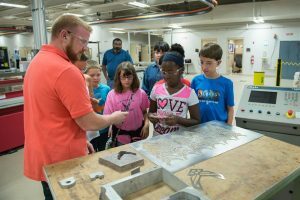 Science, Technology, Engineering, & Math are all areas more students need to get interested in, and with amazing organizations like NASA stepping in to help, it is creating an interest for kids to get into manufacturing. A Quick Spotlight on Jim Filipek – With MFG Day coming up quick, it is so crucial for those in the manufacturing industry to share their insight and their passion with the younger generation for working in this industry. Jim Filipek and his family have been part of the manufacturing industry for years, and after 11 years working in it, he taught in a high school machine shop for two decades, and since 2009, has been a full-time coordinator/instructor for the College of DuPage’s Manufacturing Technology and Welding programs. Great job, Jim! The 3D Experience Center at Wichita State University – The National Institute of Aviation Research has teamed up with Dassault Systems and Wichita State University to provide the venues for future products and technologies to be developed while being part of a network of companies and experts. What is called the Innovation Campus spreads across 120 acres and over 25 buildings, where students can work on robotics, virtual/augmented reality, reverse engineering, additive manufacturing, and more. The North Carolina Triangle Apprenticeship Program – The NCTAP is an incredibly successful apprentice program to get young people in the manufacturing industry. Especially since they have programs that start as early as the 11th Grade in high school, this is a very important and valuable program that shows these students there is financial prosperity to be had in these careers – even while learning on the job! Check out Edge Factor – Do you have NetFlix and Hulu? Who doesn’t? Imagine a video platform similar to these two programs specifically geared towards the manufacturing community. It exists! Check out our interview with Edge Factor’s founder and what inspired this multi media platform to be created. With more and more students connected to streaming sources for entertainment, this could be a great venue to cultivate interest. Already working in manufacturing and want some resources for better OEE or productivity? Call us at (877) 611-5825 or fill out a form here to contact us.